VizTerra is not the only 3D design software program offered by Structure Studios. Pool Studio is the industry leader in professional 3D swimming pool design software. With the click of a button you can continue designing your VizTerra project with all the 3D swimming pool tools Pool Studio has to offer. This powerful design option is available to all VIP Suite Members. VIP Suite: In order to design in Pool Studio, you must currently be a VIP Suite Member. If you are a VizTerra Member, you will receive a message that you must upgrade your membership in order to edit your project in Pool Studio. VIP Suite allows you to create projects using both the 3D swimming pool design tools of Pool Studio and the 3D landscape design tools of VizTerra. With VIP Suite, you can switch between both programs at any time. For more information about VIP Suite please Contact Us. 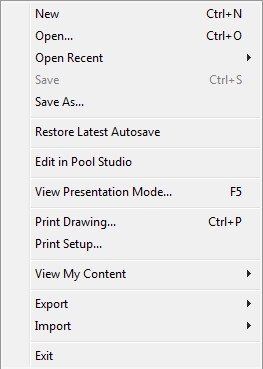 Edit in Pool Studio: Select Edit in Pool Studio from the File menu to switch from VizTerra to Pool Studio. After you select Edit in Pool Studio from the File Menu, the Switch Product window will open up. This window will ask you if you would like to save your design and open it in Pool Studio. Click Yes to continue or No to cancel the action. Saving Files: When you switch to Pool Studio your project will save automatically. If you do not want to save your project, select No and then close your project before switching to Pool Studio. If you have not yet saved your file, a Save As window will be opened and you will be prompted to enter a file name for your design. If you have a blank project open or no changes have been made to your project since the last time you saved it, you will not need to save. Once your project has been saved, VizTerra will close down and open back up as Pool Studio. Your project will be loaded and you will be at Stage 1: Project Information. Features of Pool Studio: Pool Studio features unique swimming pool design tools not found in VizTerra. Pool Studio allows you to professionally design a complete swimming pool. With Pool Studio you can customize the pool depth and created steps and benches. You can also choose from a wide range of pool interiors and products from leading manufacturers. Pool Studio also allows you to design spas, slides, rock waterfalls, and all sorts of water features. The Pool Studio library contains pool specific items to complete your design. While Pool Studio has unique features not found in VizTerra, it is just as easy to use as VizTerra. That is because both programs were created by Structure Studios. You will find that the Pool Studio interface is almost exactly the same as VizTerra, including the Stages, Panel, Library and everything else. You will instantly be able to start designing with Pool Studio as easily as you design with VizTerra. For more information on Pool Studio, please see What is Pool Studio? Fine Menu: You may return to VizTerra at any time by going to the File Menu in Pool Studio and selecting Edit in VizTerra. You will again be asked to save your desgin. Pool Studio will then close down and reopen as VizTerra.